I find the current world’s climate (both environment and political) to be worrisome to say the least, and the people at Little Lost Fox seem to be in agreement about the solution: more nature. But we can’t just forget about what society has built either, can we? 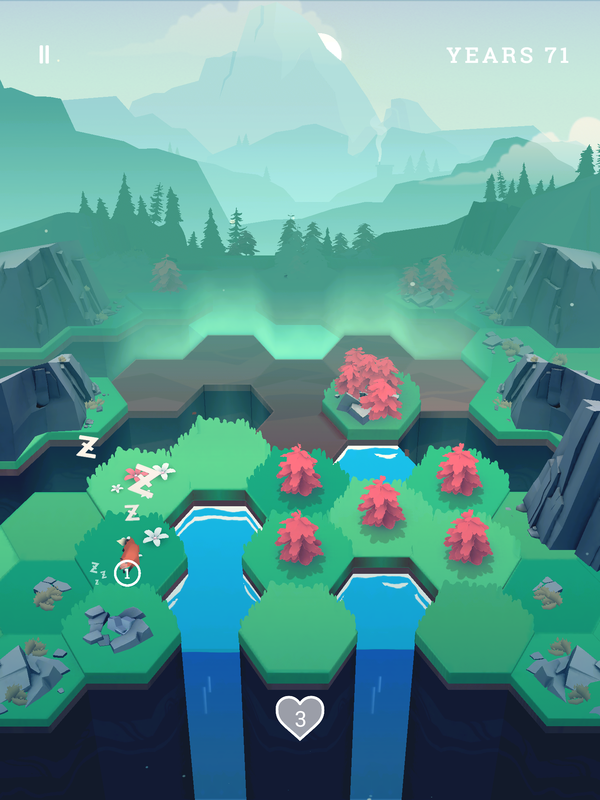 This is the dilemma presented in Valleys Between ($2.99), where you need to create a near-perfect natural space, formed by hexagonal tiles and inhabited by animals. 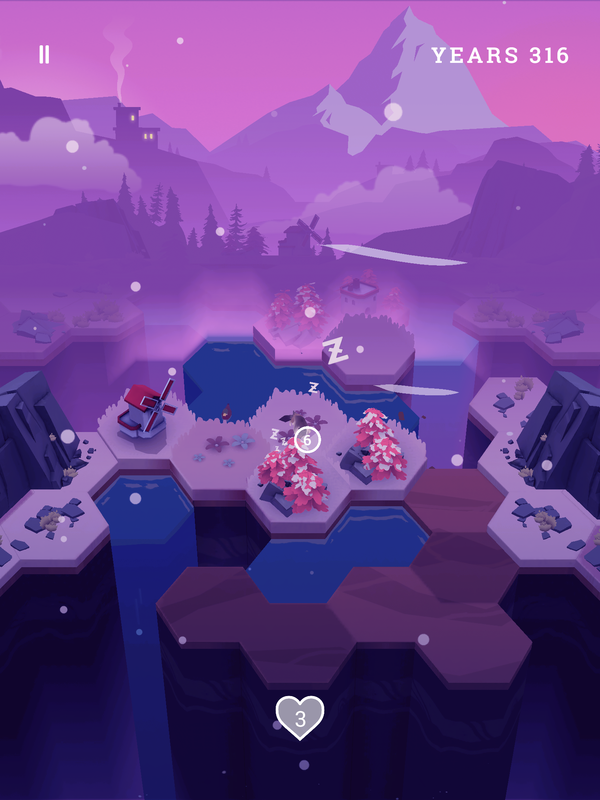 The experience created is remarkably calming despite the serious content, allowing the player to reflect upon how the game relates to real life while they swipe up and down on tiles to change them. The game is set on hexagonal tiles, found nestled in a valley. The goal is to combine tiles to create new space at the front of the board, so you’re continually expanding from the bottom of the screen. Swiping up or down can change a tile, as well as those around it. The tile base is a simple dirt ground. One swipe up on the dirt creates water in that tile, and grass will grow on all adjacent tiles. Swipe up on grass, and a tree will grow. Combining trees is needed, as that it was creates more empty land. Three trees create three extra spaces, five trees create five, and so on. You can keep combining trees into other combinations, but often the game board will move too quickly to string more than a handful of trees together. Animals are an important part of Valleys Between, as they’re able to put out fires, grow flowers, and essentially stop the world from crumbling. As you play you’ll accumulate points that can be used to unlock animals, which become available through level progression; you begin with the fox. Animals can only travel on grass so you can use trees and water to help direct them to where they’re needed. Swiping up has a variety of effects, all on adjacent tiles, including putting out fires and removing environmental hazards. Depending on the size of the animal (small, medium, large), its attributes may vary slightly. Animal size categories can be upgraded as well, decreasing sleep and respawn time and increasing speed. Level progression is so gradual that I barely noticed it happening. A level ends when you run out of life (represented by a heart on the screen), or is completed when the quests listed have been completed. The quests usually don’t have to be done in one run-through, so you can die and revive as many times as you need. There is no stress or pressure to do them, so I often just play and the quests are completed without intent. It begins with simple tasks (such as growing the world to fifty years or creating 20 forests) and gradually becomes more difficult (grow your world to 300 years or creating 50 forests). When I do focus on the quests, though, it brings me back to contemplating the delicate balance of nature and the destructive quality of humans. It’s not humans that put out fires or stop obelisks from exploding – it’s the animals, regardless of their size and strength. Animals and nature are the solution to the problem. I love that the animal selection varies from common to endangered, because regardless of their conservation status an animal is a valued part of the Earth’s ecosystems. There is barely any difference in the base stats of, say, a wolf and a black bear. You can literally see the effects of your hand on the world, as it darkens and brightens in additions to the seasons changing. It’s at these times of transition that the game’s graphics truly shine as a representation of the real world. You’re not trapped in a world of green and brown; rather, the valley is often steeped in shades of purple for the winter, or orange for the autumn. In winter, large snowflakes fall close to the screen; in autumn, the leaves swirl around with gusts of wind. There are even small movements in the world, such as the sun or moon moving slightly in the sky with every passing turn. The soundtrack works perfectly to bring the player a bit further into the game, and I find it enhances focus. Once that happens, time slips away in the real world while I try to create the perfect valley. Valleys Between is nearly a meditative experience, allowing your brain to focus on one thing even just for an instant. There is also the soothing background noise of nature; the chirps, tweets, and whistles sound downright whimsical. Difficulty-wise, Valleys Between sits in the sweet spot between being easy and hard. I am not a patient person, but this game allows me to find that place where I’m in in hurry. You cannot move forward without considering what you are doing, often several turns in advance. In addition to building tiles up, you can knock them back to nothing by swiping down… but it’s at your own risk, as the entire column will jump and something will change, although it won’t always be in the location you want. Undoing tiles is my least favourite part of the game so I actively try to plan in advance so it doesn’t happen, but sometimes it’s unavoidable. Valleys Between offers a remarkably calming experience despite the dangers that can appear. Being mindful about the environment you control with the touch of a finger allows you to also reflect on your physical world. The level difficulty is balanced compared to current progress through the game. The graphics, music, and sound effects combine to create a thoroughly awe-inspiring experience. But perhaps mostly importantly, Valleys Between is a well-needed reminder that life, the universe, everything is about finding the right balance.